2019 EarthEcho Water Challenge Kick-off! On Friday, March 22, the 2019 EarthEcho Water Challenge kicked-off with a special launch event in Houston, TX involving over 2,000 students, across YES Prep Public School Campuses, in learning about the value of water and monitoring local water quality through the Water Challenge program. The EarthEcho team, including founder Philippe Cousteau, joined YES Prep Public School educators and students, the Galveston Bay Foundation, and volunteers from EarthEcho Water Challenge program sponsor, Xylem Watermark, for the kick-off at the YES Prep’s Gulfton campus. 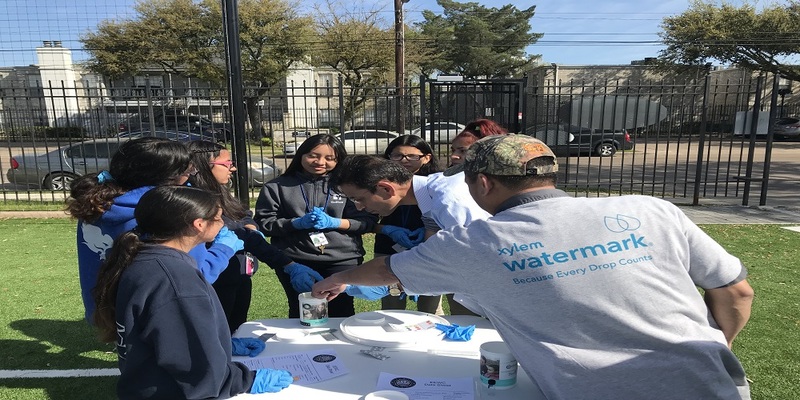 With support from the Xylem Watermark team, students had the opportunity to monitor water quality and learn about the importance of taking action to protect local waterways. Students also had the opportunity to learn more about the impacts of water quality on local marine and aquatic ecosystems, as they participated in educational programming led by the Galveston Bay Foundation, which included activities focused on stormwater runoff, oyster ecology, marsh grasses, dolphins, estuary habitats, marine debris, and more! Students from across the YES Prep Public School sites are sharing their data through the EarthEcho Water Challenge database and will participate in additional water monitoring in the coming weeks, as they develop their own waterway conservation project action plans. Check out our album of photos highlighting this special event. YES Prep Students joined EarthEcho Water Challenge partners and participants, as well as Xylem Watermark volunteers, who hosted World Water Day monitoring programs around the world. From Mexico to Ecuador and the Netherlands to India, young people and community members took action to monitor and protect their local waterways, kicking off the Water Challenge and renewing their commitment to their local bodies of water. The Water Challenge launch also featured a special virtual field trip broadcast to over 1,000 young people around the world, the announcement of the 2019 EarthEcho Water Challenge Ambassadors, and the launch of the new EarthEcho Water Challenge Action Portal. We are grateful to our program sponsors at Xylem Watermark, our partners at YES Prep Public Schools and the Galveston Bay Foundation, as well as our global network of partners and program participants for their commitment to monitoring and protecting local waterways. We look forward to an impactful year ahead!